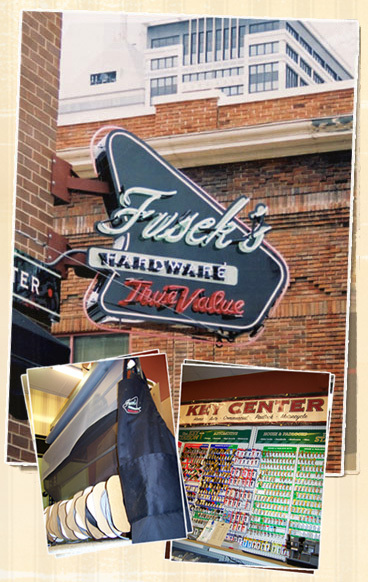 Fusek’s True Value Hardware, located at the heart of downtown Indianapolis in the Historic Lockerbie Neighborhood. Fusek’s was established in June of 2004 by Steve and Sue Fusek. Hardware was top of the list of most needed elements to make a revived downtown more livable. Together the Fusek’s have served Indianapolis, as Downtown’s only Hardware store, filling a void that has existed for many years. Fusek’s 10,000 square foot store was their first venture into retail hardware. While the core of their business is electrical, plumbing, tools and fastners, the home decor and hardware is what really differientiates them from their competitors. At Fusek’s True Value Hardware there is truly something there for everyone. Fusek’s Hardware chose to align with True Value Company as a main wholesaler of hardware goods. True Value has taken an exciting and refreshing turn, in the past few years they have taken a complete review of all products offered to find the right products at the right prices for today’s customer. Fusek’s now features name brands like Scotts, 3M, GE, Levolor, Benjamin Moore, Milwaukee Tool, and Schlage. Each and every one of our lines has been significantly updated and improved. True Value gives our store credibility, and Fusek’s gives it personality. Our goal is to be the best hardware store in town. We strive to be the solution to your problems. Come in and check us out!